One of the best ways to learn how to work with color and color value (and select fabrics) is to view quilts that other quilters regard as mistakes. It's mistakes that help us grow -- and help give new quilters some insight into what not to do. The quiltmakers who submitted these quilts labeled them ugly. I think maybe surprise quilts might be a better word. And some of the quilts in this gallery are first quilts -- very good first quilts. It's just each person's conception based on what she/he expected to make vs. what actually came through. I have been disappointed in some of my quilts, but have to confess that I've never seen an ugly quilt. To me all quilts have a special place. I think Kitty is absolutely correct. From Recycle Sally: This is not my first ugly quilt -- it is one of many, and an example of what happens when you drink and quilt... LOL. From Gina: This was my first attempt at creating something from scratch, before I learned how to really quilt. I had no help or guide, only a 2 year old boy excited about Thomas the Tank engine, and a bunch of cheep ugly fabrics. If you can tell, the eyes are stuffed and puff out. Too weird. From Afra: I made this quilt from all the left overs from the first couple of quilts that I made. I had only been quilting for about a year and I didn't have much of an idea about colour or pattern. If I could do it over I would take more time to consider pattern and colour distribution. From Diane: What was I thinking? This was only my second quilt, and I think I made a mistake in my fabric choices. However, my family likes the quilt and I'll probably keep it on the wall (in an upstairs bedroom). 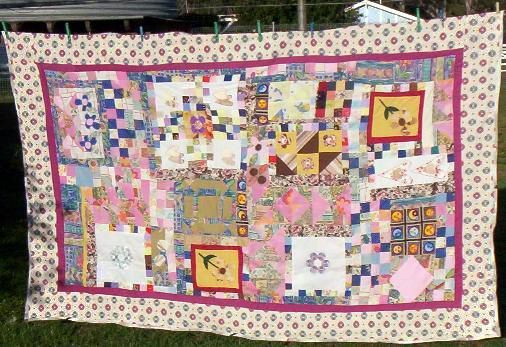 From Janet: Diane, I'll bet that I hear from lots of people who love this quilt, who think it should not be in the Ugly Quilts gallery. From Debby: I loved this black and white Zebra print with the bright colors, but when I put it together, it was just too much. I think I would like the fabric in smaller doses. Judy (Sisneros) would be frightened at the results of this quilt, called Pizazz on Point. From freemanor: I was making charity quilts, crazy quilt style, and was centering anything I thought would interest children. This is one center I should have never used. From Michele: This was one of my first quilts. It was 1987 and I was living in Lawrenceville, Georgia. I walked into my first quilt shop fell in love. I bought scraps by the pound and made the quilt in a class. It looked great to me at the time, but I think it's really ugly now because the colors do not go together. I would use only three or four colors, like red, white and black. Yellow, blue and white. All colors that look good together. I learned to put fabrics together to get the warm fuzzy feeling later in my quilting journey. I am more careful with my stitching now, using a smaller stitch so the quilt doesn't come apart. I was nervous in the beginning, because it was the first time I used a quarter inch seam and I was worried the seams wouldn't match up. From Cathartes: This wasn't my first quilt but it was my first ambitious attempt at a busy pattern. The fabric choices looked so good laid out next to each other. Then I cut and pieced it all into a horrid mess. It took me 2 years to get through it since it was so ugly. But I wasn't about to waste all those bits of fabric. From dorisy123: When I first started to quilt I worked with scraps a lot. I got them from a group that loves to quilt -- they were more than thankful to get rid of them. Some said that this quilt was very nice but I think they were just being supportive. It was enough to get me hooked in this craft. Now I use the scraps in a better more organized manner and I feel they really look much nicer (to my eyes anyway). From Cindy: I wanted to make a quilt for my daughter. So I decided to use up some scraps that I had. After putting it together, I didn't like it at all and I call it my "Really Ugly One." I was short one quilt block and made one nine patch out of black and white. The colors (to me) don't go together at all. Some of the blocks don't match up right. This one was my learning quilt, and I would choose different colors if I were to do this pattern over. It will make a nice floor quilt to watch TV. My daughter said she likes it just because I made for her. From Gail: I thought it would be a good idea to make a quilt out of all my leftover flannels -- wrong! I use this quilt on the bed because it's really warm, with flannel on one side and fleece on the other, but I do cover it with a nice quilt so that no-one sees it. From Liz: My sister-in-law gave my this fabric to make a quilt for her. Nice prints, but way too busy. I added some marbles to tone it down some. But I really hate the results, even though she likes it. Would definitely use a different pattern next time and probably separate the prints with a solid black. From Myna: The color is terrible. The pattern is beautiful. DH loves it. It's tied, not quilted, and it's very warm. The design could have been so beautiful with better color coordination. From KyleAnn: I have not finished this quilt, and probably won't. I love mystery quilts, but I have LOTS to learn about how colors and prints go (or don't go) together (our instructions: 1 light, 1 medium, 1 dark). There is too much commonality in my prints and the quilt is too busy, too busy. I love the individual prints. Here's one of my ugly quilts -- I have no idea what possessed me to actually finish it, because I knew it was pretty awful as soon as it was pieced together. The design is okay though -- it's my fabric choices that are, well, terrible. The pattern is online if you'd like to give it a go. From Ruth: I signed up for this class and we were all left to our own devices for fabric and color. As you can see, I'm not good at picking color and fabric. Since I made this I stick with quilt kits. I have called this the ugliest quilt ever made, and my instructor pretty much agreed with me. However, my husband likes it, so it does get used. From Jennifer: This was my first quilt made from directions. I made the quilt for my sister for letting me stay at her house for a year in 1999. I used a bunch of scrap material that sort of matched in color, but not in print selection. I would definitely choose different prints next time and use more solids. You really can't see a pattern to the quilt. My sister really likes it and treasures it, but I think it's the ugliest quilt I ever made. "Yeah, yeah, that poor quilt! It is NOT ugly! I will never part with it because it was made with love and determination. I think this quilt should be in the 'Quilts only a sister could love' web site." From Kat: I made this for a friend who has a passion for the brightest, ugliest shirts he can find (yes, he actually wears them....funny). I took several months to search out scraps of the most eye-watering cotton fabrics I could get from fellow quilters and from donated fabrics from others for our quilting group. I meant to make a quilt so ugly you couldn't look at it without sunglasses, but it tuned out like this -- actually rather cheerful. But I submit it anyway as Neil's Ugly Quilt. From Deborah: These were blocks of the month I made back in 2004. I decided to put them together with a batik fabric in 2008. I just think the colors are awful! Someone might like it, but not me! I wish I'd used different colors to enhance the blocks. From Rod: After I would get done sewing, I would sew leftover scraps together -- they became the ugliest quilt. I gave the quilt to my adult nephew and told him I would make him a nice one, too, which I did. From Inge: Here is my top of a Snowball quilt for your Ugly Quilt Gallery. My snowballs are too busy. I don't know how to finish this quilt top, but I intend to do so. Maybe find a right border? Use floss to tie in the same color? From Shirley: I like making kids' quilts. One of my daycare kids picked out the prints he wanted in his quilt. I was limited with time, so this was made in a few days. As you can see, it is a mess. If I were to do it over I would chose different fabrics and make blocks... and take my time putting it together... and lay it out before sewing it up... but then I am still learning. From Lucky: I found this (top only) at a garage sale. My friends all call it Bu** Ugly. However, I had it finished and appraised. Surprise, it is worth few hundred dollars! From Debbie: I am self taught, so this is the first quilt I did. The pattern is from a book I got at the library. Blues and yellows should have been pretty, but the points were cut off and I had to fudge on putting the blocks together. This goes in my car for my pets. They don't mind the ugly thing. From Kathleen: This was one of my first quilts. It is "supposedly" the Bento Box pattern, but I just don't know what I was thinking. Apparently I believed that all purple fabric would be lovely -- and I was wrong. I gave it to my non-quilty sister and she put it on her son's bed. No accounting for taste I guess. From Pamela: This was not my first quilt. I did actually make a few nice ones before this debacle. I remember picking out this pretty pansy fabric at the quilt shop, thinking how nice it would look with the right pattern and fabric combo! Unfortunately, this "rail fence" disaster is not it. What's amazing to me is that I kept sewing the thing together, thinking that once I got it all pieced, it would look better. It has been tucked away in the back of my closet for two years.